Certain defunct New York businesses are remembered with great fondness. 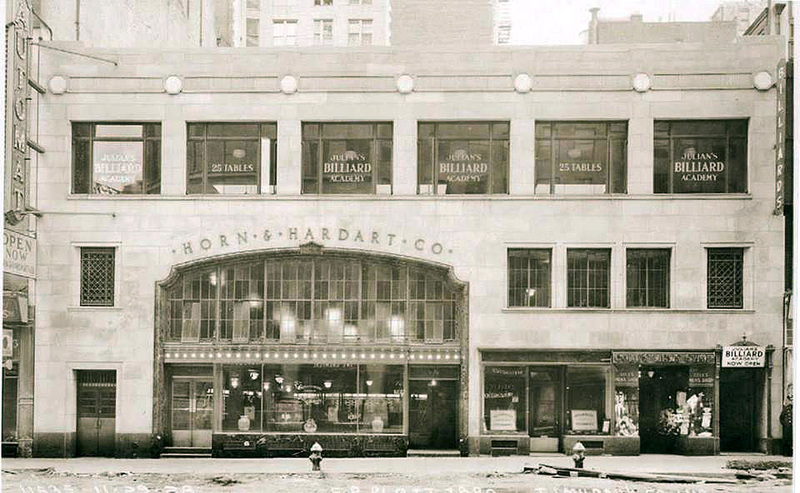 One is the automat—actually the 50 or so Horn & Hardart automats that used to exist all over the city. The fast food of their era, they dispensed hot coffee, sandwiches, baked beans, and pie to millions of busy New Yorkers cheaply and efficiently. Another is Julian’s pool academy, a seedy but popular venue for decades that’s been gone from East 14th Street since 1991.
Who knew these two beloved establishments once shared the same building at 115 East 14th Street? 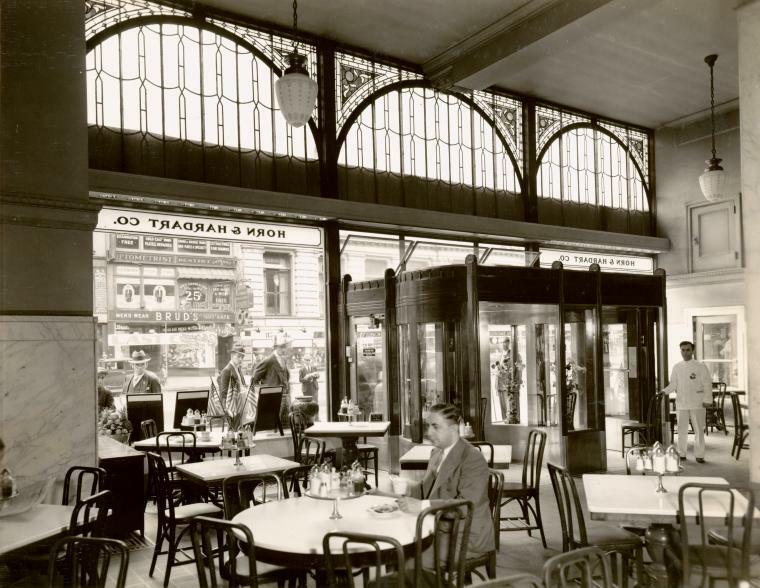 An Ephemeral reader did, and he sent this photo, from 1933, showing the original location of Julian’s upstairs from an automat. The building was demolished in the early 1980s to make way for Zeckendorf Towers, and Julian’s moved across the street to the old Palladium building, once the Academy of Music. The second photo, from the NYPL Digital Gallery, was taken two years later, showing the new revolving door at the automat. What a treat! This entry was posted on October 14, 2013 at 5:20 am and is filed under Bars and restaurants, East Village, Sports. You can follow any responses to this entry through the RSS 2.0 feed. You can leave a response, or trackback from your own site. I meant a bit west not north. Some nice things about the old days. I remember going to that pool hall in the 80s it was a dump. My mother took me to NY in 1970 when I was 10 and we went to the Automat (not sure which one) and not much of a story either.. Ever since I was going to Julian’s, the early 1960s, it was always on the east side of 14th St. Nice to know in had been on west side in the 1940s. Julian’s was never on the west side of 14th St. First it was at 115 E 14th, and then it moved to 138 E 14th until it closed in 1991. I know, got my directions all screwy and what to call them. Had too much already. I’m not one to advocate to saving pool halls or cafeterias, but tearing down that incredible building is a crime. It could have been so many other things. Same with Luchows next door. It was S. Klein’s on the Square that was demolished for the Zeckendorf Towers. my family owned a liquor store on 107 east 14th, and we eventually moved into the automat after it closed. I still have some marble slabs from the automat. I worked in this building when it was a Burger King in 1977. I thought there was a gypsy fortune teller place above? Lol my memory.